5th Annual National Poetry Month Celebration! The theme of our Reading this year is “Favorite Poets & Poems.” Our group members will be reading poems from famous poets and share a work of their own. Our group has plenty of talented poets and writers, and you will see that they are spoken work artists as well! 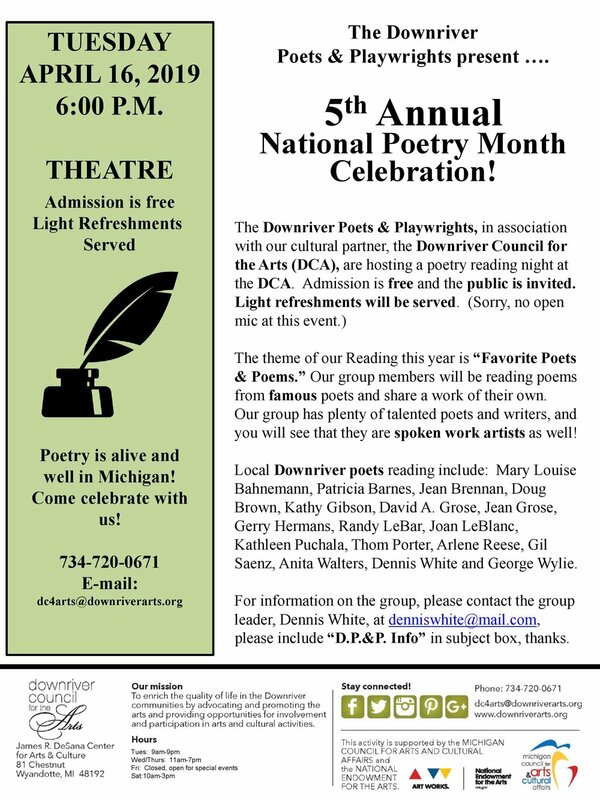 Local Downriver poets reading include: Mary Louise Bahnemann, Patricia Barnes, Jean Brennan, Doug Brown, Kathy Gibson, David A. Grose, Jean Grose, Gerry Hermans, Randy LeBar, Joan LeBlanc, Kathleen Puchala, Thom Porter, Arlene Reese, Gil Saenz, Anita Walters, Dennis White and George Wylie. For information on the group, please contact the group leader, Dennis White, at denniswhite@mail.com, please include “D.P.&P. Info” in subject box.